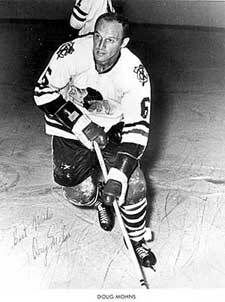 Born December 13, 1933 in the town of Capreol Ontario, Doug Mohns started his hockey career with the O.H.A' s Barrie Flyers in 1951 to 1953 as a left shooting defenseman. During this time, he played 109 games with 74 goals and 78 assists adding to 152 points. 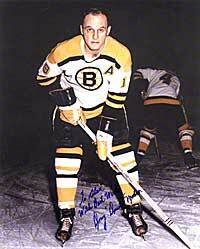 In the 1953-54 season, Doug joined the Boston Bruins with the defense team of Leo Boivin, Fern Flaman and Bob Armstrong till the 1963-64 season. He played a total of 710 games, 118 goals and 229 assists during his 10 year regular season with 35 playoff games, 6 goals and 15 assists. The 1964-65 season brought the defenseman to the Chicago Black Hawks. As a Hawk, Doug, Stan Mikita and Ken Wharram became better known as the " Scooter Line". His career with the Black Hawks ended in the 1970-71 season with 415 games, 116 goals and 163 assists during his regular season. Also in the playoffs, Doug played 43 games giving him 5 goals and 16 assists to his record with the Hawks. During the 1970-71 season, Doug was traded to the Minnesota North Stars and stayed till the 1972-73 season. The N.H.L' er had 162 games, 12 goals and 48 assists as a North Star. His playoff stats with the Stars were 16 games, 3 goals and 5 assists. After 3 years as a North Star, Doug moved on to play with the Atlanta Flames. His season there was 28 games and 3 assists from 1973-74. Doug Mohns's final N.H.L. season was played with the Washington Capitals in 1974-75. Defending 75 games, he had 2 goals and 19 assists ending his 22 years of regular N.H.L. seasons with a total of 1390 games, 248 goals and 462 assists, bringing his career to 710 points and 1250 minutes in penalty time.
" Did You Know? " Doug played for Maxie Silverman's "Juvenile Team" in Sudbury Ontario. Terry White and Doug were the only two players representing Capreol and doing a good job of it, as well as sharing the "Most Valuable Player Award" together. Doug and Terry also played for a pick up team in Capreol called the Capreol Royals with the line of Lorne Adams and Terry. Other players remembered by Doug were: Joe Close, Ronnie Sweezey, Bob Mazzuca, Stan Martin and Doug Frazier. A scout by the name of "Pinky" Louis from Stratford Ontario asked the line to go to their training camp but Terry and Doug ended up going to Barrie instead. A park in Capreol Ontario was dedicated to Doug Mohns in 1967. It is situated on Coulson Street next to the Capreol Arena. My good friend, Rudy Mazzuca, has been trying to keep me updated on things in my old home town and I am extremely grateful. I love history and there is nothing I like better than reading about the town of Capreol, its' history, and stories about the people I knew who were part of my life growing up. I have a lot of good memories that are indelible in my mind. I enjoyed reading your story about Alex and Mary Nepitt. It brought back vivid memories of the days when we shopped at Nepitt's Store and the not so pleasant memories when I had to visit the dentist in the same building. The history of the "Addie" Sweezey family is also very interesting. All three sons becoming C.N.R. Railwaymen and all three daughters marrying Conductors. Both families were well respected people in the community. I want to thank you for your time, effort, and kindness in putting together a short story on my career. Quite frankly though, I am reaching a point where I have read enough about myself and find it much more interesting reading about other people's experiences and successes. Don't hesitate to contact me, however, if you have any questions concerning hockey. It is still my favorite sport and I love to talk about it. The Very Best to You and Your Family. Regards. Doug Mohns.